I’m a huge fan of greens – whether it’s kale, bok choy, spinach, callaloo, or collard greens, they are always welcome on my plate. Ironically, as a child growing up in Guyana, I hated eating any type of leafy green vegetable. Our most common greens were several varieties of spinach, callaloo and bok choy. My juvenile taste buds found most greens to be bitter and almost impossible to swallow. Fast forward to many years later, and here I am cooking greens fairly often. For breakfast I love to add sautéed spinach in my omelets and frittatas, spinach or kale salad is a lunch time favorite as well as sautéed and served alongside my meal. Collard greens have always been the one green that is reserved for the holidays, such as Thanksgiving and Christmas. Somehow it managed to set itself apart from the others and became a staple at the holiday table. 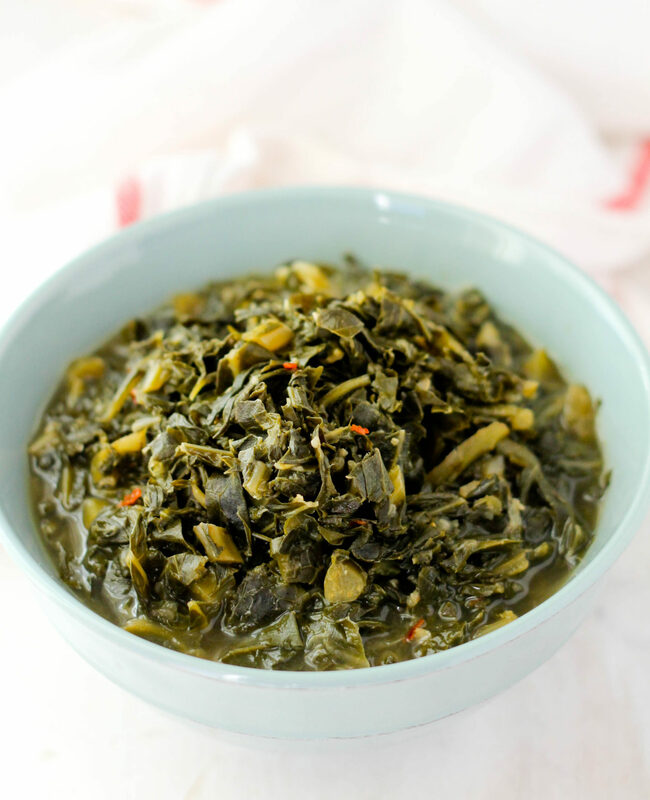 Maybe because of its unique, hearty flavor or because it is simply a labor to cook a good pot of collard greens. 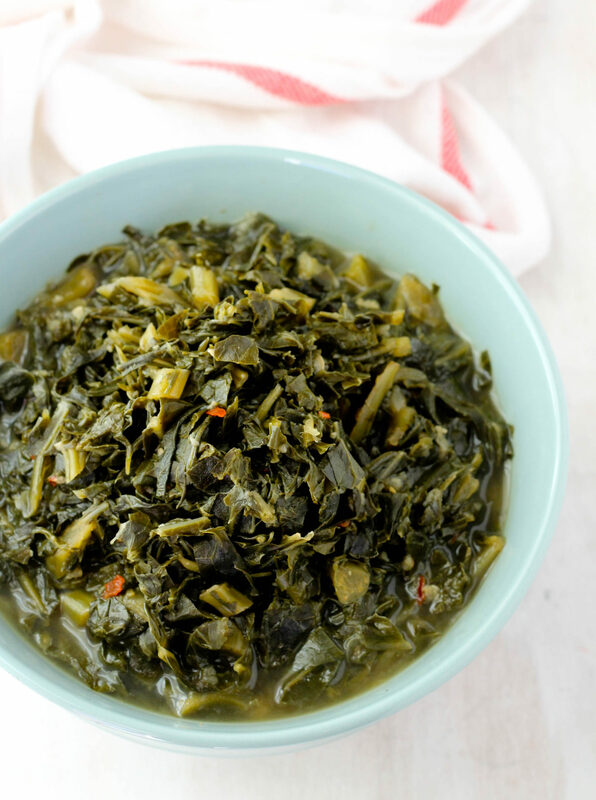 Unlike the aforementioned varieties, collard greens are quite thick and take a bit of time to cook and absorb the flavors, so it’s not something that you will usually whip up quickly with lunch. I’ve partnered with Transamerica Center for Health Studies® and the Association of Black Women Physicians who has recently released Healthier Traditions Cookbook: Soul Food which shares recipes with a healthy spin on classic Soul Food dishes. With some of us having dietary restrictions, it’s nice to have healthier options. There’s a wide variety of dishes like cornbread, candied sweet potatoes, red beans and rice, and peach cobbler, so please be sure to check it out by clicking here. The Cookbook is FREE to download! What I love about this cookbook is that they suggest healthier options for classic dishes without sacrificing any flavor; simple substitutions like using low sodium chicken broth, Tabasco and smoked paprika give their collard greens lots of flavor. 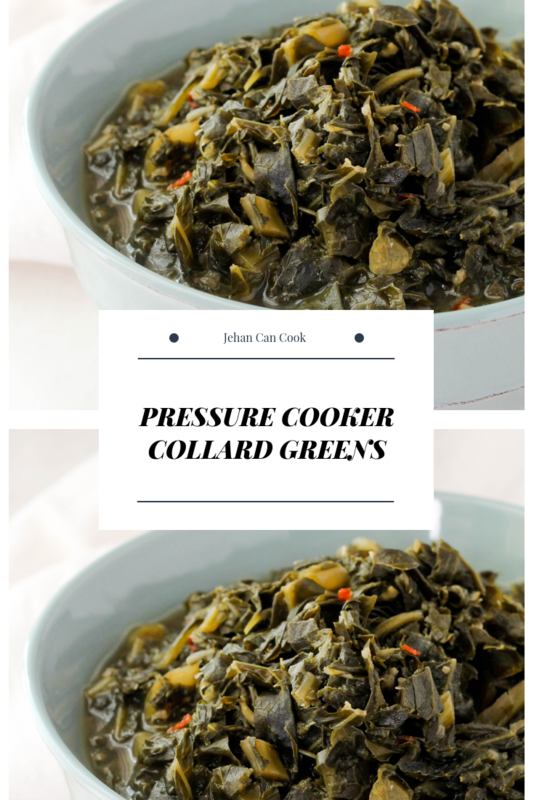 I’m sharing an everyday pressure cooker version of the collard greens recipe from the Healthier Traditions Cookbook, which takes about 30 minutes to make. 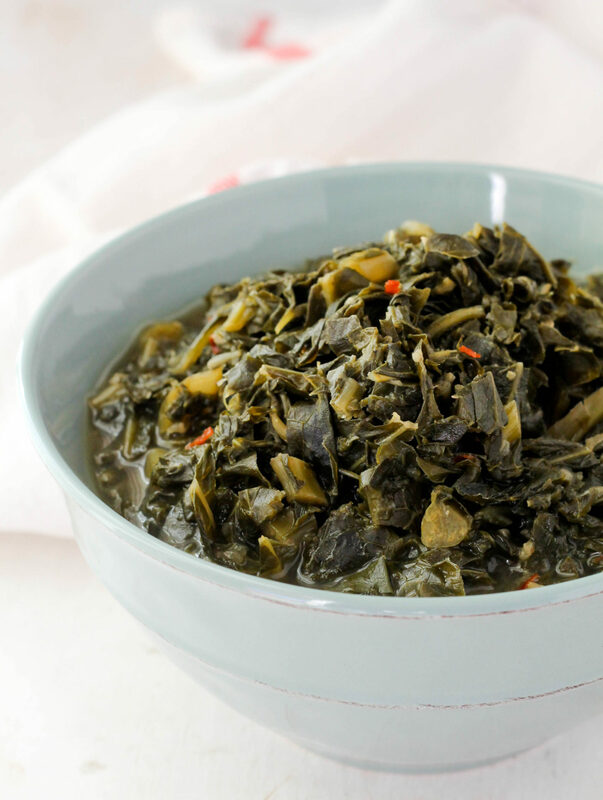 Typically, collard greens take about 1 ½ hours at the least to make, but using the pressure cooker reduces the cooking time. The greens are tender after just 15 minutes of pressuring, and it still manages to absorb a ton of flavor! You are definitely not sacrificing flavor with this cooking technique. I didn’t add any meat to this dish, but you can add smoked turkey and pressure it along with the greens. Enjoy! Heat oil in pressure cooker over medium heat then add onions, salt, pepper and paprika and sauté for about 10 minutes, until it’s softened. Add garlic and cook for about 1-2 minutes stirring to prevent it from burning. Next add collard greens cook and for about 5-10 minutes stirring frequently. Once the greens have wilted a bit, add chicken broth and cover pressure cooker. Cook for 15 minutes from when the pressure starts to whistle. Follow the directions on your pressure cooker on how to release the steam and to open it. Next return the pot to the stove over medium heat and add salt if needed, cook for an additional 10 minutes until the liquid has reduced. Remove from heat add Tabasco, serve warm.